A re-post from 2005. The Red-Tail migration is in full force right now, and I am seeing them everywhere. I had one perched�above my porch a week ago, eyes fixed on my bird feeder waiting for a squirrel. 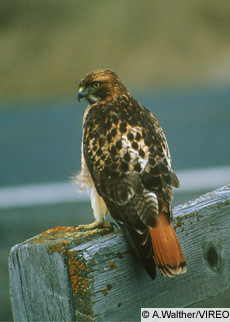 The Red Tailed Hawk is the most commonly-seen hawk in the US and Canada, especially in winter when he likes to hang out along highways and in suburbs, on the look-out for rodents. His white�chest is usually more noticeable than his rusty-red tail which is only seen from the back, or when he turns in flight and the sun catches it. He is a "buteo" - the large, plump, soaring family of hawks with rounded wings (called buzzards in Europe). The Red Tail is a versatile creature, able to make a home even in NYC's �Central Park, where "Pale Male" has been raising families for several years on rats and pigeons.�This hawk's�call is a distinctive "Keeeeeeer" which sends a chill down the spine of all little warm fuzzy critters. He'll take a pheasant from a shooting field, but his hamburgers are rodents -�rats, rabbits, squirrels�and mice. He will grab a foolish�pigeon if he can. He is migratory, with population shifts south during winter, such that our New England winter birds are likely Canada breeders. I'm a big fan of birds of prey. And the red-tail is a great one 'cause they're everywhere - I get to see them often. I get pretty carried away and whacky when I see my hawks and osprey. A while back I watched some TV show (probably PBS) about Pale Male in NYC. Those people are full-fledged loons! They really need to get out more. After a neighbor shot a 'chicken hawk' back in the early 60's, I carried a claw from a Red Tailed hawk for years in my pants pocket, the modern equivalent of a 'medicine bag' I suppose. At any rate, I've always been fond of them, and declared them one of my 'totem' animals - my brothers of the air. Any time I see them I always wish them good hunting. I can immitate their cry fairly well - it'll often cause a rabbit to freeze in position long enough for me to make a good rifle shot. Yes, the call does that. From time to time, a Red Tailed Hawk perches on a pole or branch overlooking my bird feeder. My neighbor and my son have also seen it. It's killed at least one rabbit and one mourning dove that we know. The feeder also attracts field mice (and cats), chipmunks and, of course, squirrels, which I also feed separately with nuts and corn. I am only four miles out of Chicago but near the forest preserves that stretch out for miles. So we get a variety of wildlife and the woods are full of deer. For those who can't imitate the red-tail's cry a good, sharp and short whistle will generally freeze a cute little bunny long enough to, ummm..., point something at it. Turning out of my driveway across from a nice park/nature center here in southern Ct. a larger wingspan bird swooped and turned in a graceful move about 50 ft in front of my car. It looked like a 5-6 ft wingspan. Absolutely beautiful. I have no idea what it was. Any ideas?